What is it that separates a visionary man like Buckminster Fuller from the run-of-the-mill cranks and lunatics? It can’t be that he was right because here it is 2010 and we still aren’t living under domes, our cars still steer with their front wheels and our homes still weigh tons more than they need too. Puzzling over how much my house weighs was one of the quirky insights I picked up while watching The World of Buckminster Fuller, a 1974 documentary by Robert Snyder and Baylis Glascock now released on DVD as part of Snyder’s Masters and Masterworks series. 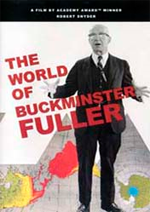 This film is not so much about Fuller but rather Buckminster Fuller explaining himself in his own words. As such, it is a fascinating historical document. Fuller was great at pitching his ideas. Appropriately the film begins with Fuller lecturing on the concept of “Spaceship Earth,” a theory that defines the Earth as a closed system. This is in contrast to an infinite one that allows for perpetual growth. It is not an idea that originated with him but he certainly popularized it. A finite Earth seems obvious today but in the 1960’s it was a radical idea, and one we still have yet to accept. Fuller was an idea man, the definition of a futurist and a real conceptual artist. The film moves briskly from one challenging and intriguing idea to the next. It is no wonder that Fuller developed a devoted following in the counter culture years of the 1960s and that the establishment Time Magazine called him a “nut job.” As Fuller speaks, you can see he has spent his life explaining himself. And as this is his side of the story, there is no counterpoint. Neither the film nor Fuller flinch at mentioning one of his first schemes from the 1920’s. He proposed to place a string of portable dirigible bases across the North Pole. This is an idea that has stepped right off the cover of Popular Mechanics along with moving sidewalks, flying cars and jet packs and adds some credence to Time’s characterization of Fuller. Well, most anything with dirigibles would do that. The dirigible-born Dymaxion building (“Dymaxion” being Fuller’s word for his thinking-out-of-the-box designs) is the jumping-off point for his post-WWII idea of The Dymaxion house. Like everything else he came up with, there were a lot of good points to the all-aluminum Dymaxion house. It could be mass produced, it conserved water, and was self cooling by way of a clever roof venting device. The plan was to use the over-developed and under-utilized American aircraft industry to meet the post war housing demand. But as Wikipedia points out, “No Dymaxion house built according to Fuller’s intentions was ever constructed and lived in”... so we got Levittown instead. This was also true for Fuller’s Dymaxion car. With its efficient aerodynamic profile, front wheel drive, and agile rear wheel steering, it should have made it the car of the future... the ultimate in efficient transport. Three were built and one still survives in a museum. It was never put into production. There is just a hint of the Dymaxion car in that ’60s stalwart the VW micro-bus. A lot of time in the film is spent by Fuller describing his theories of nature and geometry. Fuller believed that nature relied on classical geometric principles. At one point in the film he says that because π is an irrational number, nature does not use it. Yet he lived to see the rise of fractal geometry and I wonder if he had the endless ‘irrationality’ of fractals in mind at the time. If he did, it’s not mentioned. For Fuller, the tetrahedron was the ideal natural shape and he demonstrates his theory with the aid of a D-stix modeling set. I’m not sure if it’s a valid proof of anything, but it is fun to watch Fuller at work. This film was made when it seemed Fuller’s ideas were at last getting some traction. Grand geodesic domes were being built, ecology was becoming a household word and pictures were coming back from the Moon that showed the real Spaceship Earth. But that was about as far as all that went. Fuller died in 1983 and perpetual growth came back with a vengeance. Maybe Fuller’s ideas haven’t been fully realized because they are rational and human beings are not. I think we are still catching up to this extraordinary futurist . The World of Buckminster Fuller is almost 40 years old and yet he and it are still ahead of our time. The “special feature” Modeling Universe is not much of an extra feature as it is one section of World re-edited. If what you really want to see is Buckminster Fuller playing with geometric solid shapes, this is where you’ll want to go. Maybe I’m getting spoiled but I’ve seen so many old prints that have been juiced digitally that the washed out images in World seem shabby. Or you can see them as authentic archival footage... your choice. Warning! Because this is a one-sided argument, this DVD will have you pounding the table and saying “Damn right!” and “Why aren’t we doing this? What’s wrong with people?” After viewing, avoid ranting... if possible.